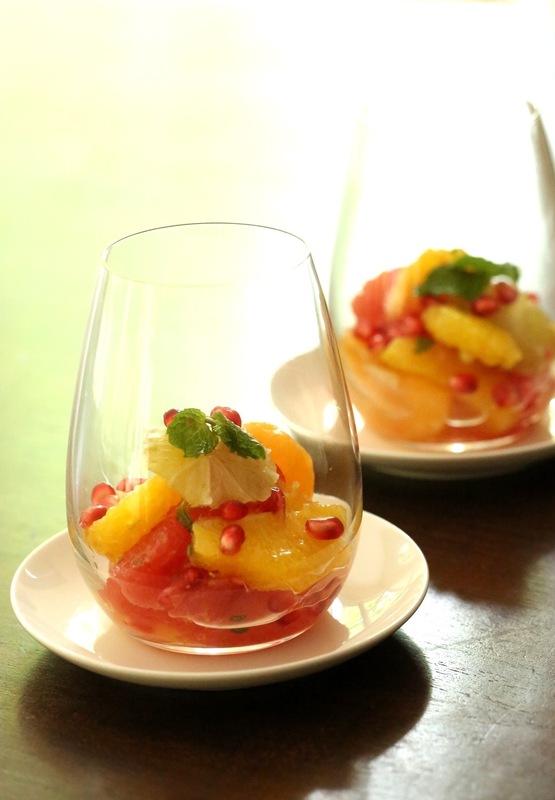 Citrus salad is a fresh, zesty and healthy dessert. The ideal sweet treat to have when you’ve been overdoing it. I have certainly been doing plenty of that. I ate a shameful quantity of chocolate at Easter and way too many leftovers since! Fruit for dessert may not seem exciting at all – perhaps even a little bleak – but when it has been delicately cut and well presented I don’t feel quite so deprived. And while it is a healthy dessert it can easily be upgraded to deluxe with the addition of whipped cream/coconut cream, ice cream, yoghurt or sorbet. Do you have a favourite healthy dessert? Remove about half of the zest from both the lime and orange. Place in a bowl. Remove the skin from the lime and cut the flesh into rounds and add to the zests. 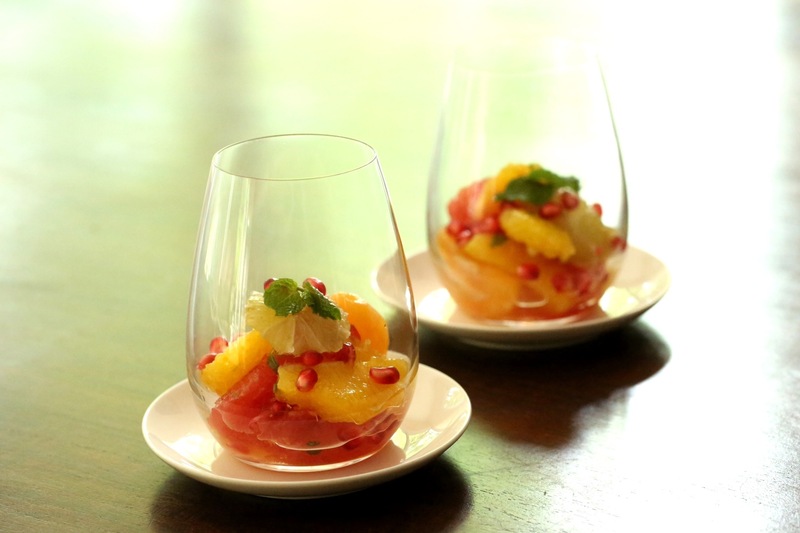 Remove the skin from the orange and grapefruit and cut the flesh into segments; adding to the bowl as you go. Peel the mandarin, separate into segments and remove as much of the white as possible. Place the mandarin with the pomegranates into the bowl. Add the sugar syrup and gently toss. It may be stored in the fridge at this stage, if needed. Add the mint just prior to serving. 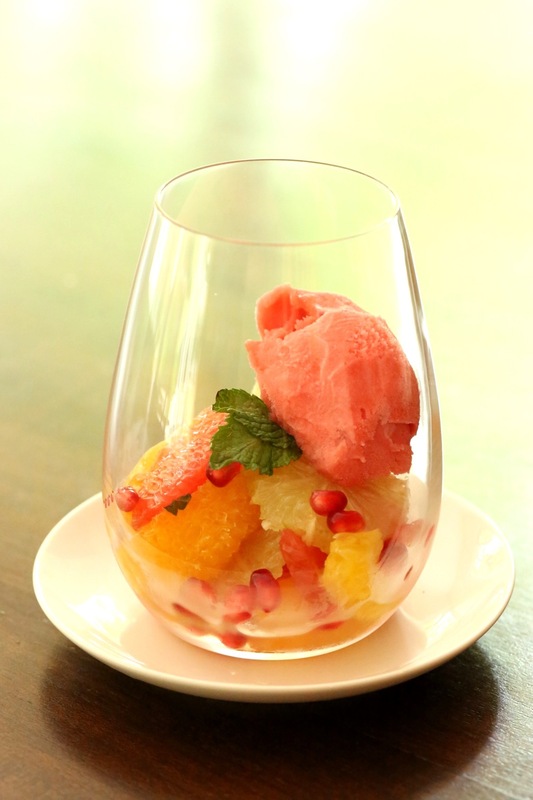 Citrus salad with a small scoop of berry sorbet. Posted in FruitTagged citrus, dairy free, egg free, food, food photography, gluten free, health, vegan, vegetarianBookmark the permalink. I used to like pickled beets, orange slices and baby spinach but I’m rethinking that after looking at these photos. Thanks Maureen! Beets, orange and spinach sounds like a nice combination. The salad looks so bright and cheery, like summer in a bowl. I imagine some watermelon (though that would break the citrus theme) would go wonderfully with it too! Thanks Li! A combination of melons, such as watermelon and rockmelon, would be a great idea! I adore citrus and this citrus salad is so pretty. Yes, we eat with our eyes first and I love the way you present this lovely treat. 🙂 I think I need this for detox too after all the Easter chocolates. Thanks Amy! I think presentation is so important with such a simple dish as this. Thanks Lorraine! Fresh figs are such a treat. This looks so delicious and refreshing! Yum! Thank you! It was very delicious. I love these photos. These desserts would be absolutely lovely to enjoy at the end of meal.